New month, new boot spots. This time we take a look at all the awesome boots that were in action in March, including the gorgeous adidas Deadly Strike Pack, a new CR7 chapter and some special unlaced Mercurial Vapors. Dig in and get your boot spot fix! We're starting our boot spots with adidas Deadly Strike Pack's on pitch debut last weekend. Along with his teammates, Dutch star Arjen Robben destroyed Borussia Dortmund in his leather version of the adidas X 17.1 Deadly Strike - a boot that's very popular in the eyes of many adidas X players. Another guy that destroyed his weekend opponent and a another debut for a Deadly Strike boot. In his Predator 18+ Deadly Strike beauties, Dele Alli bagged two goals in the derby against Chelsea, almost securing Spurs a spot in the UEFA Champions League next season. We're staying in the English Premier League with the next one. In March, Japanese striker Shinji Okazaki played his first game in the stunning new colourway of the high quality Mizuno Rebula V1, shining up the pitch with the 'Yellow Aurora' boots. Though the international friendlies break isn't many people's favourite thing, we're often lucky to watch great boot-action. In the big game against Brazil, German defender Jerome Boateng took on the pitch in a well-known boot, but was creative in his choice of laces. Well done! Last month, Lukaku featured in our boot spot wearing the Nike Mercurial Vapor 360 as it looked like he had sealed a deal with the Swoosh. Now it seems like there's no contract at all. Against Saudi Arabia, he played in the Cold Blooded colourway of the Predator 18+, but since then he has again laced up in his orange Vapor 360 for Manchester United... Looks like Lukaku does whatever he wants! French super talent Dembélé has stayed true to his Mercurial Vapor 360 boots, but like some other - for example Douglas Costa - he has switched the Orange OG colourway to the more recent Black version of the speed boot. Awesome to see these in action as well! More FC Barcelona boot spotting: Last weekend, Messi was subbed in and made sure that his team didn't loose the game. A pretty decent debut for his brand new adidas Nemeziz Messi 17+. Might be the coolest colourway of the silo so far? Now to our final Deadly Strike boot spot. Serie A topscorer Ciro Immobile has been indispensable for Lazio this season, and last weekend he fired in two more goals, having now bagged 26 goals in 27 games. Looks like the Nemeziz 17+ is his ultimate weapon! You almost can't say boot spot without thinking about Cristiano Ronaldo. Last time around CR7 had just debuted his Limited Edition Kim Jones boots. In March's international break, Cristiano played his first game in another boot: his signature CR7 Chapter 6: Born Leader, matching his Portugal uniform perfectly. And of course, Ronaldo secured the victory for his national team once again. Finishing off this month's boot spots with a special one. We've already seen the Mercurial Vapor 360 all over every pitch in the world, but this you haven't seen before. 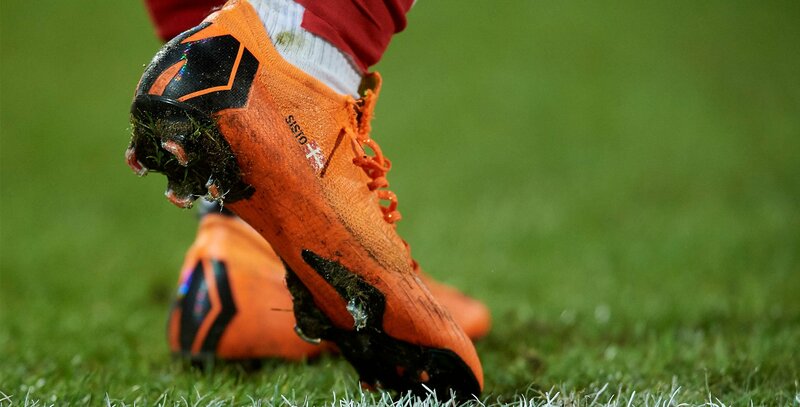 Danish international Pione Sisto feels his fit is way better when he doesn't lace his boots and when he apparently also rips open his boots... Ladies and gents, we present the unlaced Vapor 360 (seriously, don't try this at home). Still not sure if you found the perfect football boot for you? See our huge assortment of football boots and make sure you find the perfect fit.